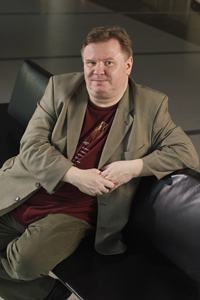 Jouni Kaipainen belongs to the same generation as Magnus Lindberg and Kaija Saariaho, all of whom studied in the 70s and then took somewhat different directions as composers. The core of Kaipainen's music is melodic, while the core of his melodies is twelve-tone music and the movements that followed. In addition to composing he has been much in evidence as a writer on music and as an active polemist. Kaipainen learned the rudiments of his profession from his composition teachers at the Sibelius Academy, Aulis Sallinen and Paavo Heininen, who represented fruitfully contradictory approaches to musical thinking. Kaipainen's respect for uncompromising professionalism, technical inventiveness and skill, and his generally modern attitude stem from Heininen, while Sallinen's influence can be detected in a more down-to-earth approach admitting the composer's responsibility for the audience combined, when appropriate, with an unabashed pluralism. According to Kaipainen, what a composer needs most is imagination. He refuses to let his imagination be curbed in any way, whether musical or social. He is a modernist, but the past, too, is present in his works. 'New' is not a genre for him, but a challenge to study and seek. Kaipainen's oeuvre covers every major genre; he is currently working on his first opera. He is an articulate writer, valuing all forms of contact with the public and the music community. Creative activity is a kind of constant communication. Kaipainen's background as a member of the Ears Open society founded in the 1970s fits in with his approach to communication. In hindsight, this group played a more important role in stimulating interest in contemporary music than as a unified school of composers. It was there that Kaipainen developed the professional ambition and the open-minded but critical attitude to the world. An eminently cultivated artist, Kaipainen is capable of clothing the widest variety of impulses and ideas in musical garb. No preacher or demagogue, he seeks to arouse the curiosity of his listeners, to entice them with the strength of his imagination, and to share with them the joy of seeking and finding new paths. Kaipainen currently holds the Composer-in-Residence post with the Tampere Philharmonic Orchestra.